While webOS Synergy does a great job of taking your data from various online services and combining it together so you can see all of your data together, setting up and managing those various accounts in webOS 1.x was not the most efficient or elegant process. Not only was there no consolidated place to view all your existing accounts, there was no way to choose which aspects of the accounts you wanted to utilize on your device. For example, if you wanted your Gmail email and messaging accounts but didn’t want to load in your Gmail contacts or calendars, you needed to manually delete the Gmail Account from the Contacts or Calendar apps. 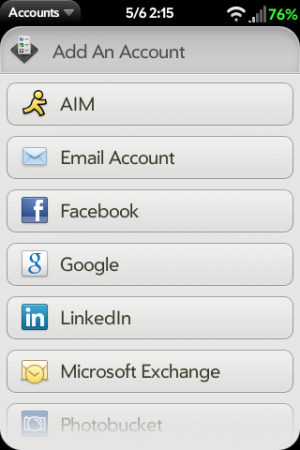 Luckily, there are a few major enhancements to the Synergy account management in webOS 2.0. While you are still able to add an account within a specific app, there is now a dedicated Accounts app in the launcher that shows your current accounts and lets you add a new one. And when you add a new account (either from within the Accounts app or a specific app), webOS will then prompt you to select the available apps that you can use this account with. Simply toggle the ON/OFF switches for the apps you want and then back-swipe out of that page. Removing an account for a specific app is just as easy as adding one in. Just go into the Accounts app and tap on the Account you want to remove. If you want to remove the account from just single app, simply toggle the ON/OFF switch to OFF. If you want to totally remove the account from webOS, tap the red "Remove account" button on the bottom of the page. As with webOS 1.x, adding or remove synergy accounts may take a bit of time to complete, so be patient and let it do its thing until it’s complete.